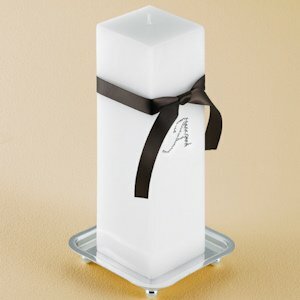 SHARE This personalized square unity candle set will make a unique statement at your wedding! Add your personal touch with a rhinestone-studded initial and your choice of black, chocolate brown or white ribbon. 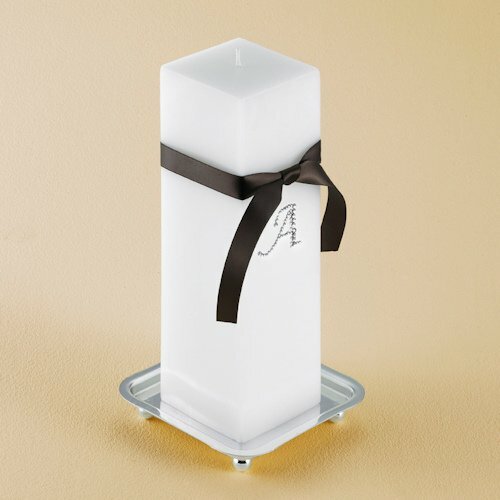 Perfect for formal, black-tie weddings, this contemporary unity candle stands out from all the others. This piece could be used in the couple's home each year to mark their anniversary. Each white candle measures 3" square by 9" tall and includes a silver-toned candle stand.